Lending an air of Williamsburg to downtown Haddonfield, a crowd laced with costumed reenactors gathered on the front steps of the Indian King Tavern. Click to see larger photo. floor assembly room of the Indian King Tavern museum last Saturday. The reenactment of the historic event that changed New Jersey from a British colony to a sovereign state was the centerpiece of Saturday's celebration marking the 100th anniversary of the tavern building's 1903 acquisition as the state's first historic site. The ceremony also kicked off a yearlong series of centennial programs commemorating "A Century of Stewardship" at State historic sites. Administered by the State Park Service of the New Jersey Department of Environmental Protection, the state historic sites program now maintains more than three dozen sites ranging from Barnegat Lighthouse and the Walt Whitman House to Princeton Battlefield State Park and the Essex County birthplace of President Grover Cleveland. Portraying Governor William Livingston, William James Kurzenberger chairs a meeting of 1777 State Assembly members in the reenactment. Also see larger photo. gathered, the crowd was laced with clusters of men dressed in business and military garb of the revolutionary era. Visually, the street scene was reminiscent of a pageant in downtown Colonial Williamsburg. Gov. James E. McGreevy did not attend but sent a proclamation declaring that "State historic sites perpetuate knowledge of the core values and historical identity" of the state's people. His statement also proclaimed that "the lessons of history and our noblest achievements are necessary to the present and future well being." 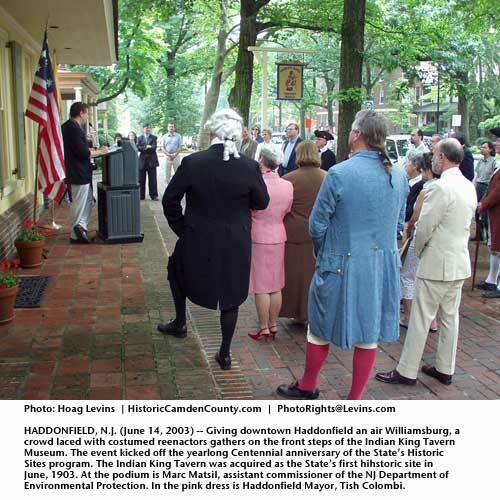 As that document was read from the podium by Marc A. Matsil, assistant commissioner of the New Jersey Department of Environmental Protection, some wags in the audience quietly suggested that perhaps the governor was too busy planning more budget cuts for historical and cultural sites to make the trip to Haddonfield. None in attendance, however, were willing to discuss the ongoing budget cut debate for the record. On display at the Tavern Museum for the day was the 226-year-old original State Seal of New Jersey. Its design was adopted by the Assembly meeting in the Tavern in 1777. Click to see larger photo. that became the official instrument of state authority adopted by the assembly in another 1777 session in the same room. The solid-silver medallion was transported from Trenton to Haddonfield accompanied by Joseph Klett, Chief of the New Jersey State Archives. Mr. Klett explained that the seal created in 1777 was in use until 1928, when the design was modernized and a new solid-silver seal made. The seal has been so much a symbol of the state's authority that it has traditionally been handed off by each outgoing New Jersey governor to each new governor on inaugural day. 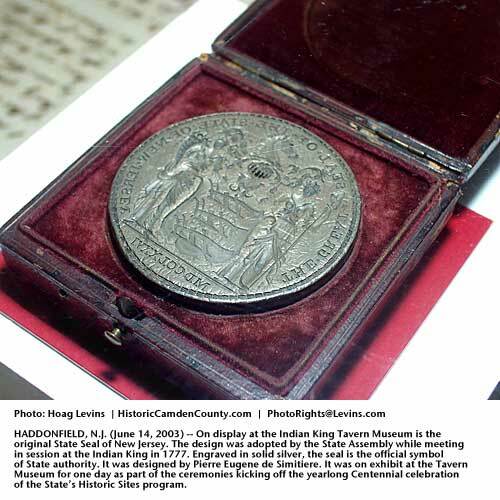 The 1777 seal is on permanent display in the State House in Trenton and is very rarely loaned to other sites. 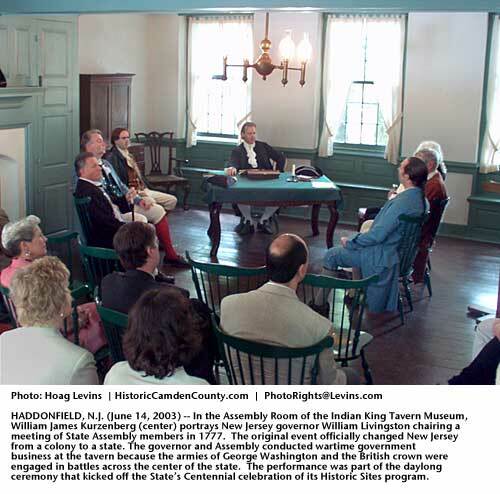 By late morning, the crowd filled the second-floor Assembly room of the Indian King as a reenactor for Governor William Livingston, first governor of New Jersey, took his place surrounded by similarly costumed members of the Assembly. In 1777, as the armies of George Washington and King George lunged at each other across the towns and fields of central New Jersey, the Assembly fled south to safer haven in Haddonfield. At that time, the Indian King's meeting room was the largest public gathering space available outside of regional churches and Quaker Meeting Houses. Using the exact words as recorded in the minutes of those long-ago gatherings, the reenactors engaged in the war-related business that made the Indian King such a pivotal part of state history. New Jersey's status was changed from that of a colony to a state. New Jersey's State Seal was adopted. 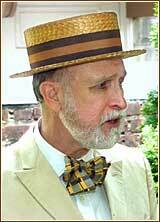 Paul Taylor, the recently-retired supervisor of New Jersey State Historic Sites, was a special guest at the Centennial event. to today's Homeland Security Office, was empowered to take actions against local residents and agents working in collusion with the British army. Following the day's first reenactment, Paul Taylor, recently-retired supervisor of New Jersey historic sites, said, "This was on the Williamsburg level of historic interpretation today; the performances as well as the period clothing are first rate." He also noted that "with all the bad news about budgets, this is just the kind of uplifting, positive event the State Park Service and our historic sites need." Mr. Taylor, who is widely credited with bringing a new level of historical professionalism to state sites during his tenure, made a special effort to laud Bill Mason, a state historic preservation specialist who is the Indian King Tavern Museum's manager. "Mason deserves a lot of credit for what he has done here over the years. I remember when he started, no one told him that what he had in mind to do was impossible, so he went ahead and did it," said Mr. Taylor. "He completely furnished this place with handmade replica furniture and it is an entirely different experience because of him and the volunteers he organized." "Now, visitors arrive to get an accurate feeling and impression of what a large town tavern would have looked like at the time of the Revolution. Nothing else like this exists in New Jersey, and elsewhere across the country there are only a handful of such sites, like Fraunces Tavern in Manhattan, Gadsby's Tavern in Virginia and the taverns at Williamsburg."